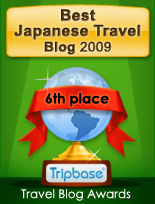 Way back, before Mike's Blender was even a glimmer in my eye, I traveled to a little known island off the coast of Japan named Shikinejima. Only a few hours distant from Tokyo by boat, I never would've thought to find sparsely populated islands with tropical-like climates and white sand beaches. Since that trip years back, I've dreamed of one day returning, and finally got my chance this long weekend. Shikine island is the fourth in a chain of eight islands streching south of Tokyo, and is the smallest of the bunch at only 3.9 square kilometers. Why did I happen to go there and not one of the others? Its small size and relative distance from Tokyo mean that most tourists tend to overlook it in favour of the other islands, and hence is the perfect place (for me) to get away from the madness of Tokyo. However things didn't start out as glorious as I'd hoped. 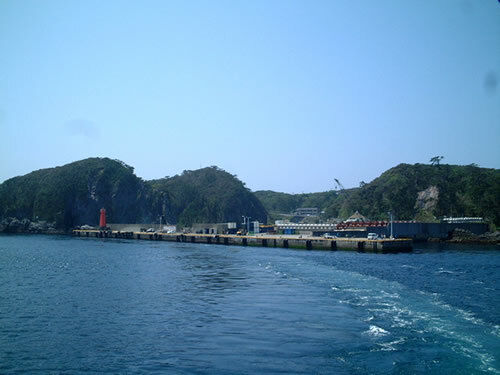 The last time I went, my friends and I took the overnight ferry from Takeshiba which drops you off at Shikinejima at around 8:30 in the morning. In my memory, we partied for a few hours, then spread out our sleeping bags and slept, fairly comfortably, right on the deck. The glaring difference this time around was the million or so other people already waiting to ahead of Kumi and I at the port. Perhaps we went during low season last time? Even though I had reserved tickets, we had to wait almost 30 minutes in line to get them. After that we had to wait another 30 minutes or so in the line that was boarding the boat. In despair I almost bailed on the whole idea. Could all these people even fit on one boat? It didn't seem possible. Being from Canada, I just can't get used to the Japanese way of battling your way through crowds, lines and traffic jams just to have a vacation. Back home, traveling to and from your destination is part of your vacation, not so over here. 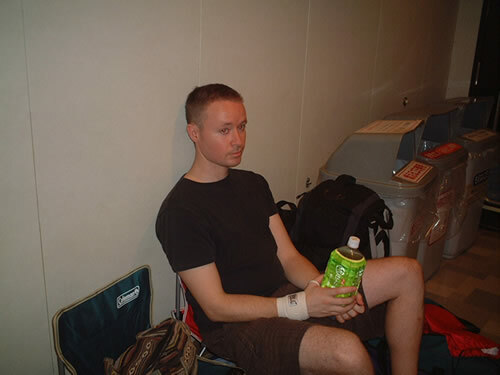 Once we finally made it on the boat, is was so crowded it seemed like we might have to stand up the whole 8 hour journey, but we managed to find some cramped spaces in the halls where the first class cabins were located. I figured we wouldn't be allowed to lay our stuff down here because we'd be disturbing those few people that actually paid money for private rooms, but the boat crew gave us the go-ahead. Here I am in my little space next to the garbage bins, feeling a bit down. As this was an overnight trip, we eventually spread out our air mattresses and lay down to a surprisingly comfortable sleep. Fortunately, things picked up after arriving at our destination. When we got to the port, everyone else seemed to be getting picked up except Kumi and I. What else could we do but set out on foot to the campsite? It was a good 20 minute walk up very steep hills, with 20 kilograms of luggage. However halfway there, some random guy in a truck stopped and asked us if we needed a lift to the campsite, our obvious destination, and we accepted with relief. Help from strangers? We sure weren't in downtown Tokyo anymore! 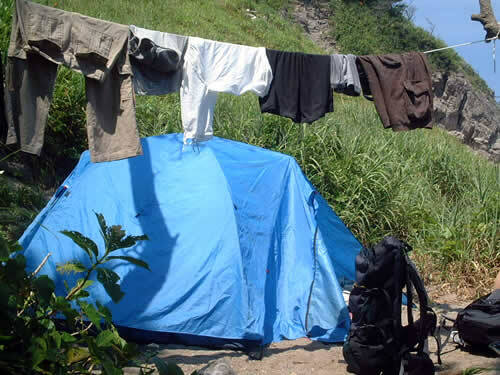 Here's our tent nestled into the hillside overlooking the beach. The spot was just big enough for my tent and my two new camp chairs. Cozy though. Here we are in front of the beach at our campsite. 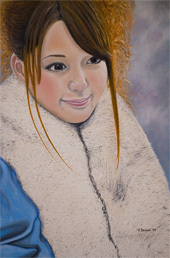 Yes, I realize I'm wearing a scarf, but it was pretty effective in giving my poor neck some extra sun protection, and anyway Kumi said it looked cool. 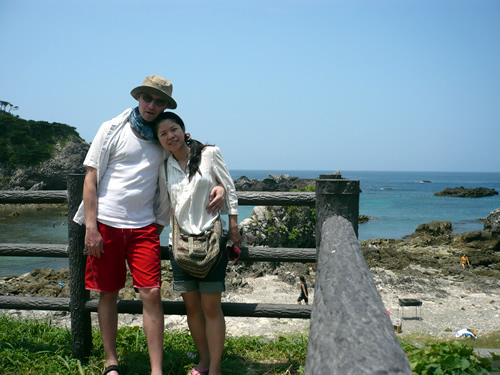 We spent a lot of the first day relaxing at Ishijirogawa, one of the island's three main beaches. 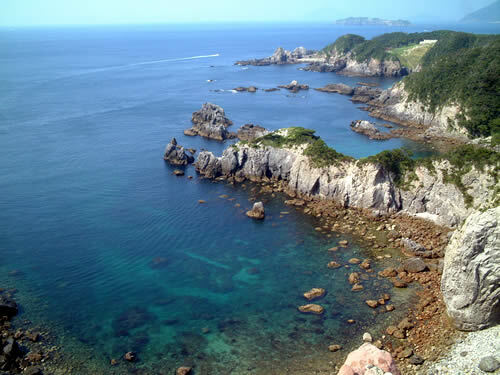 To be honest, beaches are not Shikinejima's strong point. The ones in Shimoda are much better; whiter sand, fewer rocks and bluer water, but I wasn't here looking for the perfect beach. This beach probably wasn't even the best one. We chose it mainly because it had decent shade, something the other two lacked. 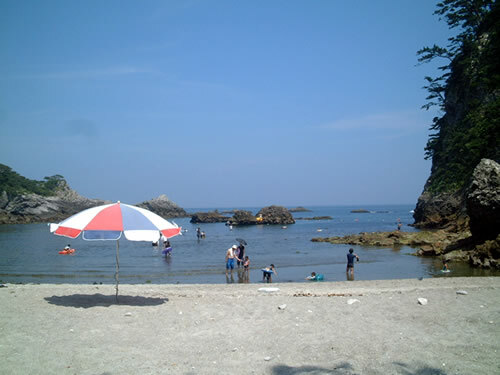 You need to wear some kind of footwear when swimming at Shikinejima's beaches as they are quite rocky. Great snorkeling opportunties though as there are lots of tropical looking fish around. Those rocks in the distance are also fun to jump off of. 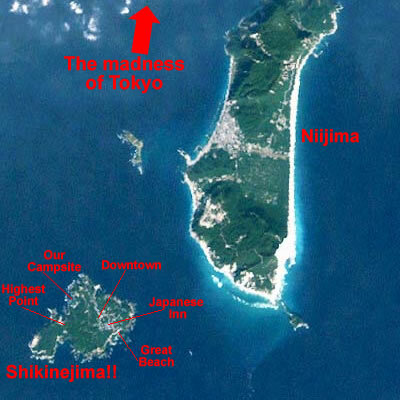 Like I said, Shikinejima is small. You can walk around the island in less than a day, but a better option is to rent bikes. 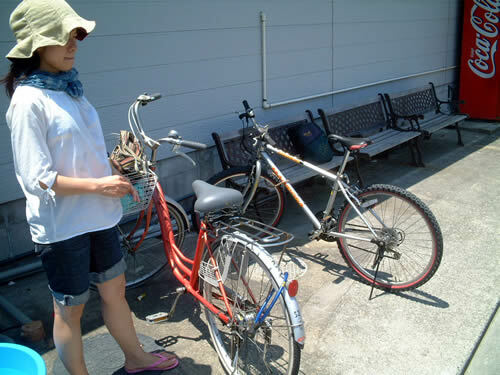 Bike renting shops are absolutely everywhere, but unfortunately most of them specialize in either the traditional, motherly kind that Kumi is standing next to, or sad little mountain bikes that have definitely seen better days. I opted for the sad little mountain bike, and although it wasn't much fun to ride, it still beat walking everywhere in the blistering heat. Here we are outside a store getting ready to buy ice cream. Shikinejima is a pretty hilly place, and while biking up was a chore, riding down those long stretches with nary a car in sight was a blast. We biked up to the highest part of the island, then did a short hike to get this awesome view. No cliff jumping here please. 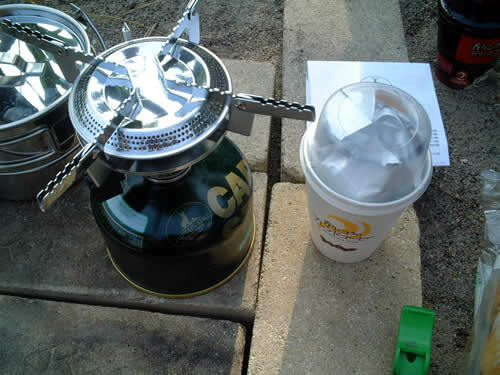 I splurged a little bit for this trip by buying a small camp stove, gas canister and kettle. What for? Well it's sole purpose was to boil some water for coffee, which it did admirably. The equipment cost about 6000 yen ($60.00), which makes those two cups of coffee pretty expensive. It was worth it though! Breakfast is served! 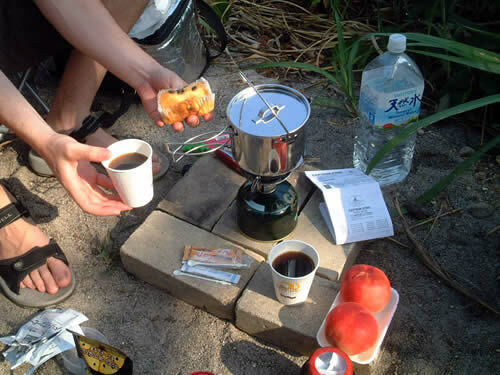 Cake, coffee, peaches, and a whole bunch of ants that weren't invited. 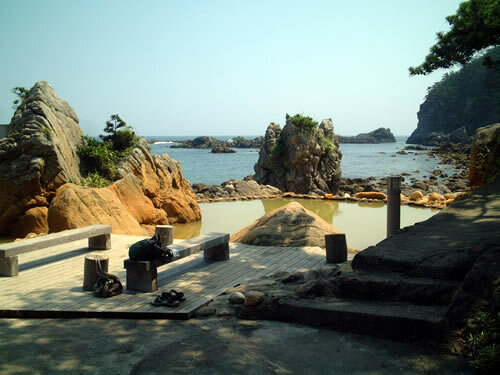 Shikinejima, like every other part of Japan, has hotsprings (onsens). Here's a more interesting one we went to that is partially connected to the ocean. When we arrived we were the only ones around for a few minutes, which was nice indeed. We went in for a bit, but the water was very brown and the rocks kind of slimy so we didn't stay long. This isn't the kind of hotspring where you can take it all off, gotta keep that bathing suit on. People living on Shikinejima have never heard of meat before. Every meal consisted of fish and fish-related things. 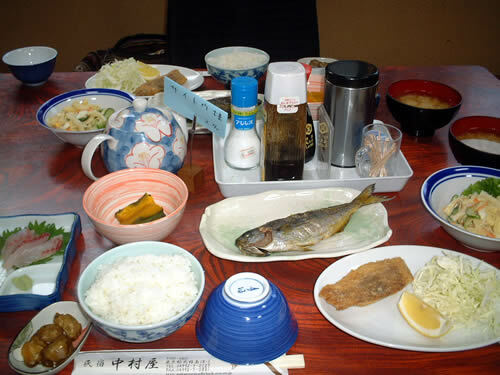 For dinner below I've got a grilled fish, some fried fish and some sashimi along with some rice and vegetables. No complaints though, it was all amazing. 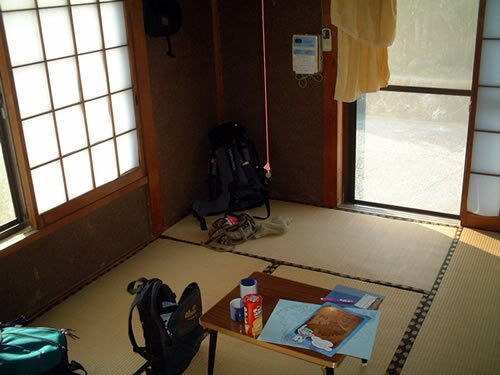 Kumi and I decided to spend our third night in a Japanese inn (minshuku). I was ok with camping for another night, but she wasn't sure if she could handle another night in the wild. Our room was pretty basic; the building was really old and our room had no washroom. It had air conditioning though, and after a night in a tent it seemed pretty luxurious. 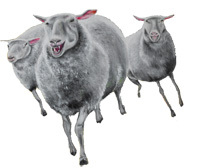 At last it was time to make our farewells and head back to the land of line-ups, crowds and rush hour. It was nice to see you again Shikinejima, but will I be back? Not sure if it's necessary as I've done everything possible there is to do on your shores, twice now. Thanks for the memories!